BEIJING, Sept. 5 (Xinhua) -- Chinese President Xi Jinping on Wednesday met with Zimbabwean President Emmerson Mnangagwa who had attended the 2018 Beijing Summit of the Forum on China-Africa Cooperation (FOCAC). 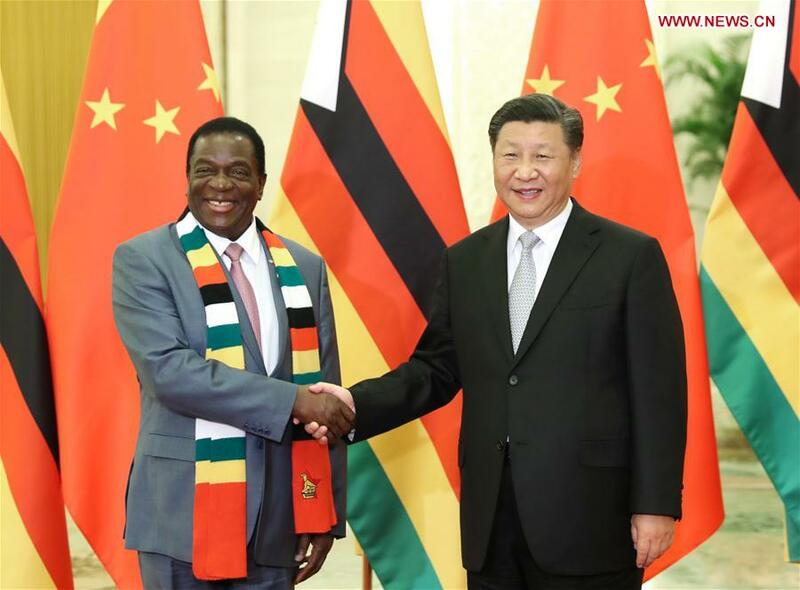 Xi thanked President Mnangagwa and the Zimbabwean government for making important contributions to the success of the FOCAC Beijing Summit and appreciated that President Mnangagwa had expressed the willingness to jointly develop the Belt and Road with China at the summit. "China and Zimbabwe have always been good friends, good partners, and good brothers," Xi said, noting that China always supports Zimbabwe in safeguarding sovereignty, security, and development interests, and in opposing foreign interference and independently choosing its development path. Xi called on both sides to continue to strengthen political mutual trust, firmly support each other on issues involving their respective core interests and major concerns, and further enhance exchanges of governance experience of the ruling party. China will continue to support Zimbabwe's efforts to develop and reinvigorate the economy and allow it to improve by itself, Xi said. The two countries should actively explore new models and areas to push for sustainable development of their economic and trade cooperation, the president said. He also urged the two sides to strengthen communication and coordination on international affairs and better protect the common interests of developing countries. Mnangagwa said Zimbabwe and China have a unique friendship and that the Zimbabwean government and people appreciate China's precious assistance to help improve the country's economy and its people's livelihood for years. Zimbabwe fully supports the cooperation measures proposed by China under the Belt and Road Initiative and the FOCAC framework, and expects to strengthen cooperation with China in investment, financing, infrastructure, agriculture, telecommunications, electricity, among other areas, Mnangagwa said.